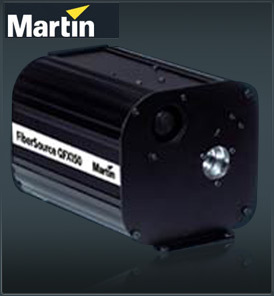 The Martin FiberSource QFX150 is a versatile source for any fiber installation. This DMX controllable fixture features a color wheel with 9 interchangeable colors and smooth, full range mechanical dimmer. A full range of up to 40 different colors is available for extra flexibility. • Accepts up to 300 flexible 1,0 mm fibers, either side or end emitting. • 6000 hour 150W lamp included produces a bright white light source. Other features include a shutter and variable strobe on the dimmer wheel. Furthermore a twinkle wheel creates sparkling effects for star ceiling and star curtain installations. The Martin FiberSource QFX150 has an extended control in stand alone mode. Via the dipswitches, virtually any combination of colors, color speed and twinkle speed is programmable. No external controller is required.